Does the antenna rotate to enable the PDA to be mounted horizontally (for landscape view in TT5)? 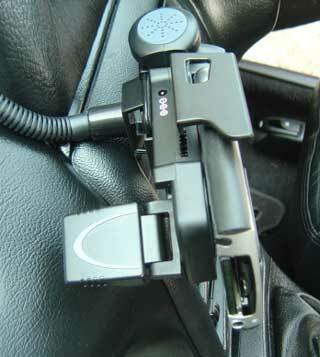 If so, does the mount hold the PDA securely in this position? 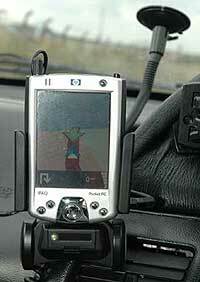 Yes, the GPS receiver rotates and so can easily be used for a landscape setup. The above shot shows the GH101 in portrait mode. You cant really see from this angle, but the antenna is not actually horizontal. It is at an angle of about 30 degrees. I gave it a try out and it seems to work fine like this. There is no way the PDA is going to fall out of the holder here. In fact I tried some impact testing with the mount upside down and the PDA didnt move at all. There is a slight question which I dont believe to be an issue of the mount and holder parting company. Mine requres a fair deal of lateral force to split them so it shouldnt bee a problem. You could always glue the two together if you were concerned though. are there any alternatives to this device that are compatible with the Qtek 2020i ? I think there are a lot of frustrated 1910 owners who would love a GPS cradle. There will be a connector available for the Ipaq 1900 series. Give us a call on 0871 7000 156. It's a shame that it hasn't got a vent mount, since I find windscreen mounts to be quite obtrusive, especially with cars with raked-back windscreens, since you have to mount them too far up. I had a SilverShield with a vent mount, but found the lack of a third leg caused it to bounce like mad. I ended up with a Seidio mount, since that gives me a rigid and totally-unobstrusive way of mounting my ipaq 2210, albeit that I had to get it direct from Seidio in Spain. Posted: Tue Oct 04, 2005 9:27 pm Post subject: qtek 2020 don't work!!!!!!!!!! i have a qtek 2020 and the gh 101 dont work!!!! (unable to open com port error)but the xda2i is note like qtek 2020? where did you get it from cos noone seems to have any in stock ? what's the freekin point ?